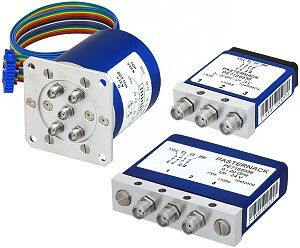 Irvine, California - Pasternack, a leading provider of RF, microwave and millimeter wave products, has unveiled a new series of low insertion loss repeatability electromechanical switches. Test and measurement applications require signal processing component performance to be highly accurate and repeatable over long periods and under extreme conditions. In automated test systems where electromechanical switches are used for signal monitoring and routing applications, every switch will add repeatability error. Electromechanical switches which exhibit low insertion loss repeatability over millions of switching cycles play a critical role to ensure overall system measurement accuracy is maintained at optimum levels. Typical applications for these switches include test instrumentation, electronic warfare, electronic countermeasures, microwave radio, VSWT, radar, space systems and research and development. Pasternack's 12 new models of electromechanical switches cover broadband frequencies from DC to 40 GHz. They exhibit very low insertion loss repeatability with guaranteed levels of 0.03 to 0.05 dB over 5 to 10 million switching cycles depending on the model. The switches are offered in three configurations: single-pole double-throw (SPDT), single-pole four-throw (SP4T) and single-pole six-throw (SP6T). They are designed with latching actuators and desirable features that include indicators, self-cut-off, TTL and 50 Ohm terminations. Impressive performance includes low insertion loss of 0.3 dB with high Isolation of 100 dB typical, and input power ratings of up to 70 watts CW and up to 1 watt for hot switching applications. These rugged and compact coaxial package assemblies are RoHS and REACH compliant, shielded for EMI/RFI suppression and magnetic fields. They are highly reliable and guaranteed to meet a series of MIL-STD-202 environmental test conditions that includes exposure to temperature cycle, humidity, altitude, vibration and shock. Depending on the model and frequency, these electromechanical switches are available with SMA or 2.92mm connectors, some models support ribbon cable assemblies for DC, indicator, and TTL logic controls. All models are export rated as EAR99. "Our new high-reliability electromechanical switches boast impressive insertion loss repeatability performance and a list of features that designers will find extremely useful. All twelve designs are available off-the-shelf with same day shipping," said Tim Galla, Product Manager at Pasternack. Pasternack's low insertion loss repeatability electromechanical switches are in stock and ready for immediate shipment with no minimum order quantity.